A decade ago, many border Texans got a raw deal when the federal government seized land for a barrier — while others pushed up the price. Will the government’s rushed, haphazard process be repeated as it pushes for a border wall? Juan Cavazos at his home on Oklahoma Avenue in Brownsville, Texas. The federal government took part of the former teacher’s land to build the border fence. The land agents started working the border between Texas and Mexico in the spring of 2007. Sometimes they were representatives from the U.S. Army Corps of Engineers. Other times they were officers from the U.S. Border Patrol, uniformed in green, guns tucked into side holsters. They visited tumbledown mobile homes and suburban houses with golf course views. They surveyed farms fecund with sugar cane, cotton and sorghum growing by the mud-brown Rio Grande. They delivered their blunt news to ranchers and farmers, sheet metal workers and university professors, auto mechanics and wealthy developers. The federal government was going to build a fence to keep out drug smugglers and immigrants crossing into the United States illegally, they told property owners. The structure was going to cut straight across their land. The government would make a fair offer to buy property, the agents explained. That was the law. But if the owners didn’t want to sell, the next step was federal court. U.S. attorneys would file a lawsuit to seize it. One way or the other, the government would get the land. That, too, was the law. The visits launched the most aggressive seizure of private land by the federal government in decades. 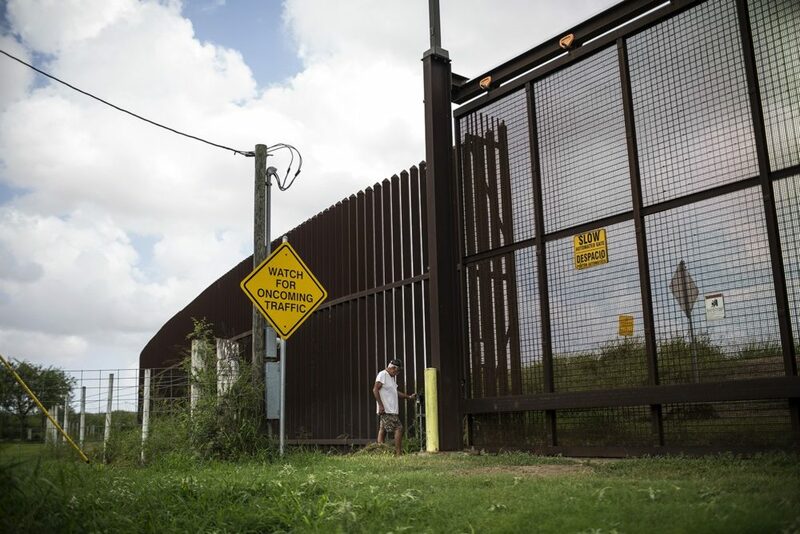 In less than a year, the U.S. Department of Homeland Security filed more than 360 eminent domain lawsuits against property owners, involving thousands of acres of land in the border states of Texas, New Mexico, Arizona and California. Retired teacher Juan Cavazos was offered $21,500 for a two-acre slice of his land. He settled for that, figuring he couldn’t afford to hire a lawyer. “We got screwed,” said Cavazos, 74. Juan Cavazos, 74, at his home on Oklahoma Avenue in Brownsville. The retired teacher accepted $21,500 for the two acres the government seized, but later discovered that neighbors who hired lawyers got paid much more for their land. “We got screwed,” he said. Homeland Security and the U.S. Army Corps of Engineers referred questions to the Justice Department. Greg Giddens led the fence building project at Homeland Security. Now retired, Giddens said his team faced pressure from both U.S. Customs and Border Protection, which wanted the fence built quickly to benefit law enforcement, and from Congress, which set a deadline to complete the structure. “Everybody wanted to do this right. But it was clear that the mission was to get this done,” Giddens said. The fence was born in the middle of a fierce national debate on immigration reform. In 2006, Rep. Peter King, a New York Republican, introduced a plan to build hundreds of miles of a physical barrier along the southern border. Although controversial, the proposal won bipartisan support. Then Sen. Jeff Sessions, the Alabama Republican, led the fight for its passage. Yea votes came from Democratic Sens. Hillary Clinton and Barack Obama. On Oct. 26, 2006, President Bush signed the Secure Fence Act. President Obama oversaw the fence’s construction. All told, Homeland Security built 654 miles of fence — just short of the 700 mile goal set by Congress — at a cost of $2.4 billion. For Trump to succeed, the federal government will have to file more eminent domain lawsuits using the same law that resulted in uneven payments the last time. Many of the players who oversaw construction of the fence are now working on making Trump’s wall a reality. Mauricio Vidaurri’s voice catches when he envisions a wall running across his family farm south of Laredo on the banks of the Rio Grande. “That’s a battle that we can’t win,” he said. “Eminent domain” probably exists as a phrase in the consciousness of most Americans in some way or another. Maybe you heard it when the government was building a highway, or clearing a route for gas pipelines. In 1215, the Magna Carta limited royal power — including curtailing the sovereign’s ability to take property from his nobles. “No free man shall be seized or imprisoned, or stripped of his rights or possessions,” it read. A man’s castle was his home, and not even a king could take it without due process. The language survives unaltered in modern British law. More than five centuries later, America’s earliest lawmakers enshrined private property rights in the U.S. Constitution. The Fifth Amendment required that the government provide “just compensation” if it took property through eminent domain — the English rendering of a Latin phrase meaning “supreme lordship.” If the government was going to appropriate property, it had to pay for it, fairly and fully. Over the decades, eminent domain transformed the American landscape. The U.S. Interstate Highway System and some national parks, NASA’s Cape Canaveral and the U.S. Supreme Court building itself — none would have been possible without federal land condemnation. During World War II, the Justice Department boasted of being the largest real estate broker in the nation. The federal government acquired more than 20 million acres of land to build bases and other military sites — an area the size of South Carolina. At the same time, the potential for abuse inspired deep-seated fear. An early Supreme Court justice described eminent domain as a “despotic power.” Property owners — from gigantic timber companies to people evicted from their homes — have fought bitterly to stop the government from taking their land, or to ensure a fair market price. On the right, conservatives have warned of the so-called “grasping hand” of bureaucratic attacks on private property rights. That concern rose to national prominence in 2005, when the U.S. Supreme Court ruled against private property owners in the landmark case Kelo v. City of New London. In a 5-4 decision, the court decided that taking land from one set of private property owners to give to another private entity was permissible as a “public use.” Kelo’s small pink house was relocated and her neighborhood was bulldozed, but nothing was ever built. One of the few high-profile supporters of the ruling was Donald Trump, then a New York developer. “I happen to agree with it 100 percent,” he said. His opinion was informed by experience. In the 1990s, he lost an eminent domain battle when a local agency failed in its bid to tear down an elderly woman’s home in Atlantic City to make room for a limousine parking lot for Trump’s casino. In response to the Kelo decision, 45 states, including Texas, passed new laws to improve landholder protections. Some states banned private-to-private takings. Others required “supercompensation” — payments at greater than the fair market value. Those reforms built on others passed over the years. California pays out up to $5,000 for property owners to hire their own appraisers. Texas provides special commissions to review land seizures before the start of costly legal proceedings. Utah created an independent ombudsman to help landowners navigate the process. Congress had set a deadline to complete the project: Dec. 31, 2008. 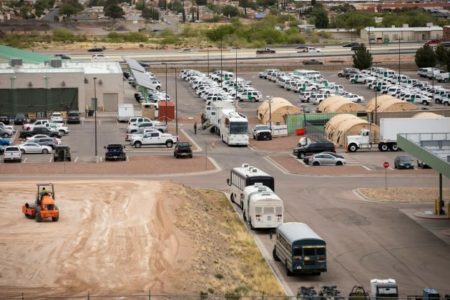 In little more than a year, Homeland Security, working through its U.S. Customs and Border Protection division, needed to issue millions of dollars’ worth of government contracts, buy 145,000 tons of steel, and build hundreds of miles of fence across unforgiving terrain. “The clock is ticking,” Giddens, head of the fence task force, warned colleagues in a September 2007 email. On Dec. 7, 2007, Chertoff announced his decision: If landowners wouldn’t cooperate, the government was going to take the land. They had 30 days to decide. “We would of course like to reach an agreement with the landowner,” he said. “But if we are unsuccessful, we are prepared to use eminent domain,” he told reporters. Over the following seven months, Homeland Security filed hundreds of lawsuits against scores of landowners along the Rio Grande. Most of the targeted acreage was farmland. But homes, golf courses, businesses and even nature preserves were sliced into pieces. Alberto Garza, 91, lost 10 acres that provided access to the sugar cane farm he had worked for 50 years. The De Leons were disowned of four separate tracts that had been in their family since the 1790s, when Spain ruled the region. Ray Loop was forced to give up a swath of property that ran in front of his home near the Rio Grande. The Nature Conservancy, one of the country’s leading environmental organizations, surrendered eight acres of its preserve. The University of Texas-Rio Grande Valley was cut off from the golf course where its team practiced. 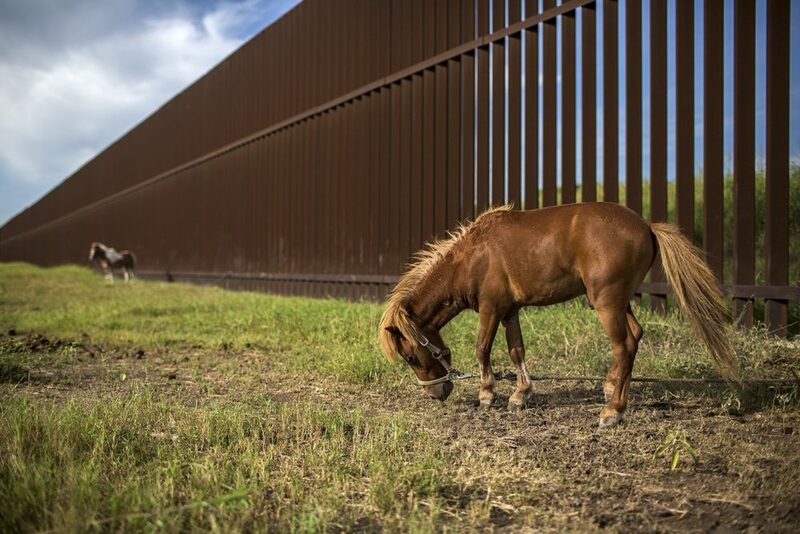 Ponies graze next to the border fence in Cameron County, Texas. The federal government seized residents’ property across the Rio Grande Valley to build the fence a decade ago. By using a so-called quick-take, a federal agency gained title to a person’s property on the same day it filed a declaration of taking in court. The bulldozers could roll as soon as a judge approved an order to possess the land. The landowner was almost powerless to stop the process. The so-called Uniform Act required the government to negotiate with the owners before seizing land. An agency couldn’t take coercive action to force a sale, and owners would receive a detailed description of the property to be seized. Perhaps the most important provision was that the government had to formally appraise land worth more than $10,000 before taking an owner to court. The appraisal had to be done according to the exacting standards spelled out in the 262-page Yellow Book — the federal government’s bible for pricing land. The idea was to prevent lowballing. The government’s initial offer to buy property was not an opening bid in a negotiation. It was supposed to be as close as possible to the final, full value of the land, priced at its “highest and best” economic use. So, for example, if you had fallow land that could be planted with crops, an agency was supposed to pay as though your fields were abundant. With virtually no public notice, Homeland Security took advantage of the loophole. It waived the law’s requirements for negotiation and eliminated conflict-of-interest provisions. The agency also increased the appraisal threshold to $50,000 for property seized along the border. In practice, the higher threshold meant that the agency did not have to formally appraise most of the property it wanted. Land is cheap in the Rio Grande Valley, and the government was appropriating only small strips for the fence. Of 197 tracts seized by Homeland Security, 90 percent were valued at less than $50,000. In place of formal appraisals, Homeland Security directed the Army Corps to assign values to targeted land. Army Corps evaluators did not have to be certified appraisers. They did not have to abide by Yellow Book standards. They did not have to identify the owners, and they didn’t need precise legal descriptions, called metes and bounds, to spell out property lines. One negotiator described a farmer’s distress at being pressured to make a decision in less than two weeks in the middle of his onion harvest. Tudor Uhlhorn, 58, a local politician, farmer and business owner, was perplexed by the federal offer to buy land he owned along the Rio Grande. 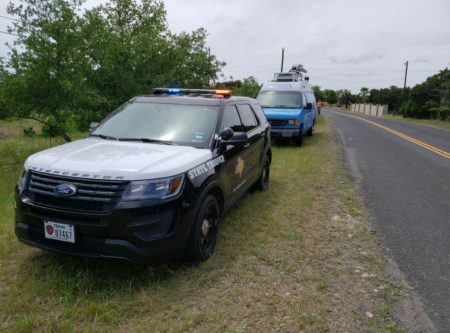 He had been involved in land condemnation cases filed by the state of Texas, and in those cases the state’s attorneys had provided detailed property descriptions and construction plans. Homeland Security sent him a map that appeared to be taken from Google Earth, with a red rectangle drawn around the targeted tract. When he asked for more information, the Army Corps sent a letter: “The accelerated schedule that is necessary to meet the Congressional mandate will not permit the completion of the ground survey before acquisition,” it read. Homeland Security’s decision — changing a single digit in an obscure line of the federal code — left landowners in the Valley vulnerable to the caprice of federal agencies more focused on fence construction than fair compensation. That’s because the Uniform Act contained a final weakness. Even if a property owner could show that Homeland Security had violated the law’s requirements, there was nothing the court — or anyone else — could do to fix it. In other words, there was a law. But there was no way to enforce it. In legal terms, it was “nonjusticiable” — beyond the reach of the federal court. Delia Perez Weaver, 74, started working on her grandfather’s farm near San Benito in the fourth grade. Back then, Mexican workers would come across the Rio Grande under temporary work permits granted under the bracero program. They would pick okra and cotton, green beans and tomatoes. To Weaver, the offer seemed low. A relative told her she’d received a larger payment for a similar piece of land up the road. The 18-foot-high fence was an eyesore that would drop the land’s value. And so much of her life, and her family’s life, was wrapped up in her grandfather’s farm. She asked the Army Corps representative for more money. He told her no. So she took the offer. The Army Corps official was right. Property owners sued by the government have no right to be assigned an attorney. They must hire their own, or find one willing to work on a contingency fee. That’s not easy. By tradition, private eminent domain lawyers take roughly 30 percent of the increase over the initial offer. Few will take on cases where the property is worth less than $100,000 — it’s not worth their time. Commissions were used in the two largest eminent domain cases in U.S. history: the creation of Florida National Everglades Park, which involved more than 40,000 lawsuits over three decades, and the Tennessee Valley Authority, a congressionally chartered hydroelectric power company that required acquiring hundreds of thousands of acres of land. Such commissions have also been used in much smaller condemnation projects, some involving as few as 16 properties. “In order to achieve fair, uniform compensation awards expeditiously for all affected owners (represented and unrepresented) in the Rio Grande Valley, appointment of a commission is required,” she wrote. Hanen is best known now as the judge who blocked an Obama order to ease immigration laws. But before, he was the “fence judge” — handling nearly all of the cases along the Rio Grande. Hanen rejected Butler’s request. A jury trial, he said, was the best forum for the cases. And there was no need to worry about defendants without legal counsel, according to Hanen, because all the cases before him already had lawyers. Hanen’s confidence was misplaced. As the lawsuits played out in court instead of before a commission, Butler’s dire predictions came true. Payments were unequal and lawsuits dragged on for years, according to a review by ProPublica and the Texas Tribune of 197 cases in the Rio Grande Valley where the government took possession of property from landowners. The review did not include cases which remain open, or temporary land seizures. The biggest group was made up of landholders of modest means, many elderly, some Spanish-only speakers. They didn’t hire attorneys and took the government’s initial offer. Half the lawsuits had that result. The median settlement was $8,000. The median seizure was just over one-third of an acre. Tomas Perez, 85, and his wife Otalia accepted the government’s initial offer after it seized two acres of their land on Oklahoma Avenue in Brownsville. “My folks are old and didn’t need to be in that legal battle, so we said, “Look, just take whatever they give you now ‘cause it’s gonna happen anyway,” said Joe Perez, their son who handled discussions with the government. Jack Coleman, 77, was a military veteran who retired from the Naval Space Command in 1996. When the government offered him $10,600 for a piece of overgrown land that he used as a personal firing range, it seemed like a good deal. It was almost the same amount that he’d paid for the entire five-acre tract years before. “They offered a more than fair price,” he said. But when taking slices of land from larger parcels, as happened in the Rio Grande Valley, the government didn’t price property in the way that real estate transactions are typically valued. But many in the Valley weighed the offer on a price-per-acre basis at a time when the best irrigated cropland was selling for $10,000 an acre. To those who didn’t know about the formula, the government offers seemed generous — at first. The Cavazoses kept cattle, horses and chickens that roamed the thick grassland and pastures behind their single-story tan brick ranch house. The area is rural: horses graze on tall grass on the sides of roads. There are no street lights, and fields of cotton, corn and citrus trees line the road. Juan Cavazos was a teacher. His wife worked as a secretary for the school district. They didn’t want the fence. They thought there were smarter ways to stop the crossers and smugglers who darted across their land. But who were they to fight the government? They figured an attorney would just take a big contingency fee. They took the money. Homeland Security built the barrier. It looms in the backyard, sharp and jagged, like a giant’s picket fence. The gate in the middle lets Cavazos stroll the back portion of his property. Border patrols officers race past on the gravel road. Had he known anything about the law, Cavazos could have argued for more money. For instance, he could have insisted that his land be valued for its farming potential — its highest and best use. Or he could have hired an appraiser to counter the government’s estimate.Cavazos didn’t know any of that, though. The sole burden to prove the full market value lies upon the owner – not the government. People didn’t have to have a lawyer to prove the government’s offer was too low — in some cases, all they had to do was pick up the phone. The De Leons fell into a second group of property owners. Like the first group, they, too, faced Homeland Security without counsel. But they were able to negotiate an increase in their final settlement. Of the 131 lawsuits in which landowners had no attorney, 30 settled for an increase of 33 percent higher than the median government offer. The payment for a median one-third acre tract increased from a median of $6,000 to just under $8,000. Many of these landowners had some familiarity with the workings of government — they were local, state or federal employees. Or they had connections to power brokers like local attorneys or politicians. Or they were simply comfortable negotiating directly with the U.S. Attorney’s Office. The government informed Rosalia Gonzalez that it would pay $700 for a little more than a tenth of an acre from a 1.4-acre lot she owned in Brownsville near the Rio Grande. Gonzalez asked for $60,000. “The United States is not aware of any land in the area of your property that has a fair market value as high as what you have requested,” a federal attorney wrote back. He did, however, boost the offer to $1,000. Gonzalez took it. Retired teacher Josephine Weaver, 80, saw her offer for a little more than a tenth of an acre of her 3.5 acre lot near Los Indios increase from $1,150 to $3,000 after she protested. “They were doing the right thing,” she said. In the De Leons’ case, the family had deep roots — historically and politically. The De Leons traced their presence in the Rio Grande Valley to the days of the Spanish empire. One De Leon has a gold-framed family tree on the wall of his home with dates going back to the 1790s, when the family’s ancestors received a Spanish land grant in the Brownsville area. At 82, Ernesto De Leon was the family’s patriarch. He once served as a city commissioner in Brownsville. He helped raise money for former Texas Gov. Rick Perry, a Republican who is now Trump’s energy secretary. 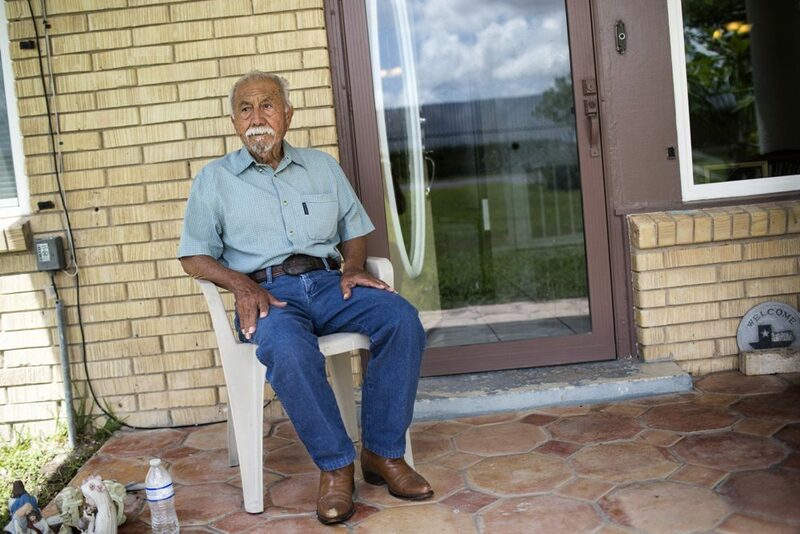 Ernesto De Leon, an 82-year-old former Brownsville city commissioner, started making phone calls after receiving the government’s initial offer for his family’s land and negotiated a higher price. De Leon wound up speaking to the assistant U.S. attorney assigned to the family’s cases. On one plot of farmland, he convinced the government to raise its offer from $13,700 to $17,000 — a modest 24 percent boost. But on another piece of agricultural land — this one closer to Brownsville — he more than quadrupled Homeland Security’s offer from $11,300 to $48,120 for the damage of losing a little more than an acre and a half from a 50-acre tract. He also worked out a deal to ensure that Homeland Security installed an electronic security gate to provide continued access to the land. The reason for the huge jumps became apparent during the battles between landholders and government attorneys: The Army Corps’ evaluators had consistently undervalued the land. As part of the government’s defense preparations, the Justice Department hired independent appraisers to evaluate the targeted land. In the few lawsuits where those appraisals were made public, the government’s outside experts invariably priced the land higher than the Army Corps’ evaluators. So when the Justice Department filed its Declaration of Taking, Koppel hired one of Texas’ top law firms, Vinson & Elkins, renowned for its ferocious litigators, to fight back. Over the next three years, the two sides faced off in court, even as Homeland Security built the fence. Koppel’s attorneys attacked the integrity of the government’s appraiser. Justice attorneys argued that Koppel’s appraiser had not properly followed government standards. And Koppel, they said, was overvaluing the market for his development in one of the most economically depressed parts of Brownsville. On one point, though, both sides agreed. The government’s initial evaluation had vastly underestimated the damage the fence would do to Koppel’s development. Koppel’s attorneys put the total price at more than $14.6 million. The government’s attorneys said it was $1.4 million. When the two sides finally settled, Homeland Security paid Koppel $4.9 million. That was the highest payout for any property in the Rio Grande Valley, and it represented a 2,043 percent increase from the government’s initial estimate of fair market value. U.S. courts have held that appraisals are more art than science. Actual market sales are the single most important component in most appraisals — but real estate in the Rio Grande Valley did not turn over often. Nor had anyone ever sold property with a border fence on it. The government’s experts were left guessing at values — and often getting them wrong. A close look at the Loop family’s case exposes the inequity of the government’s work in the Rio Grande Valley. The Loops have been farming at the very edge of America since the early 1900s. The family’s land runs along the Rio Grande at the southernmost tip of Texas, just a few miles before it unspools into the Gulf of Mexico. Loop brothers, uncles and cousins grew navel oranges and tangerines, cabbages and corn, green peas and cotton — pretty much anything they wanted to put in the ground. The rich soil, bottomland, is blessed with yearlong sunshine and warmth. The family lived the border’s problems. Drug couriers hauling duffel bags stuffed with narcotics hiked across their farm. People from Mexico, elsewhere in Central America, as far away as Romania, illegally crossed the border into their land. Every once in a while, dead bodies floated past in the river. 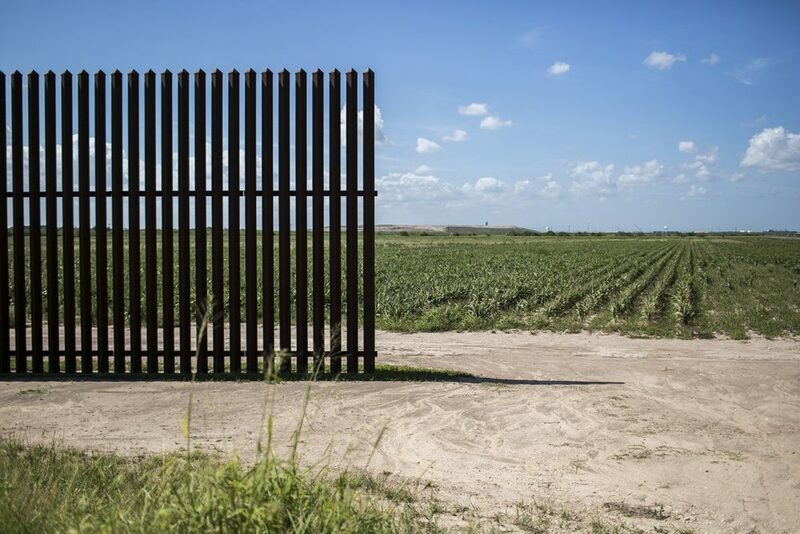 When the government came looking to build the border fence in 2007, Ray and Frank and their cousins, Tim and Paul, were working more than 5,200 acres on contiguous properties. Though the barrier didn’t make much sense to them, they welcomed the idea of better border control. “Good fences make good neighbors; isn’t that what Robert Frost said?” Ray Loop remarked. The border fence cutting across the Loops’ land was going to trap most of it between the river and the fence. It would also strand Tim’s home and Ray’s home in the no man’s land that remained. The Loops’ biggest concern was their farms: How would they be able to get to them? In Ray and Frank’s case, the government announced its intention to take 5.5 acres. The compensation would be $210,000. But issues beyond the amount of money bothered Ray Loop. He was having trouble nailing down answers to questions. Was Homeland Security going to build a gate? Would the road be wide and durable enough to accommodate his 42,000-pound, 26-foot-wide John Deere combine? And what about his family? He had three daughters. If they had a code to the gate, wouldn’t they become targets for drug dealers who wanted access? Kim Loessin, the Barron Adler lawyer who handled the Loops’ case, believed the government offer ignored key facts. Loop got money from his farm, and from a sand mining operation and a hunting camp. How would the value of the land between the fence and the Rio Grande be affected? Loessin hired a professional appraiser to judge the property’s value. Using the government’s formula, the Loops’ appraiser put the total damages across the 630-acre farm at $1.4 million. The damage tally included an additional four acres of land for fence construction, troubles with access to the farmland, and the effect of the fence on the resale value of Ray Loop’s home. The two professional estimates differed — not unusual in a court battle. But both soared far above the Army Corps’ initial estimate of $210,000. 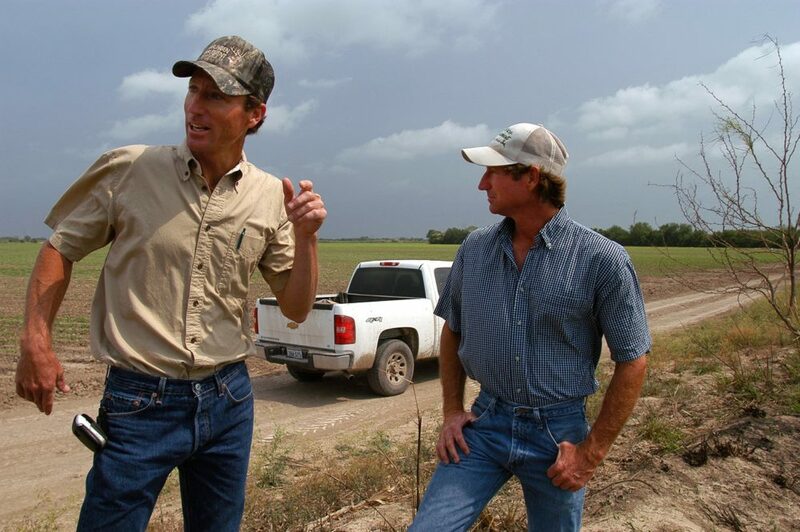 Paul and Tim Loop, seen here in April of 2008, before the border fence began construction on their land. Tim and Paul Loop decided to accept the Army Corps’ initial offer — a payment of $160,000 for the damage to their farming operation caused by the fence. It would run across seven acres on scattered strips of land. The price seemed right. “It was our desire to not be an obstruction to our government’s getting a job done,” Tim Loop declared in his affidavit. “We wanted to do our patriotic duty.” Nobody told the family that the money was supposed to represent all the losses to their farming operation. Only after Ray and Frank’s experience did they realize the government had shortchanged them. After all, they farmed similar crops, on the same land — the Loops’ farms bumped up against each other. Why were the two sets of cousins being compensated so differently? Tim and Paul tried to reopen negotiations. But by then, it was too late. The government already owned the land. In the end, the government took additional land to build the fence. By then, Tim and Paul had hired Loessin. The brothers’ final compensation was $400,000, with a loss of 20 acres. But earlier this year, one of Ray’s nightmares became real. Rising early one morning in January, he smelled smoke. A few minutes later, a Border Patrol officer texted him: “Sir, your barn is on fire I believe,” it read. The barn was actually the Loops’ home — they lived on the second floor, above a space that housed some of their animals. He rushed to wake his daughters and his wife. The family escaped unharmed, but the animals did not. Four of the family’s dogs and a goat burned alive, their cries haunting the family. Ray and his family have rebuilt their home. They are again living in no man’s land, that slice of America between the fence and Mexico. “What else are we going to do?” he asked. The end of a segment of the border fence just east of Oklahoma Avenue on Aug. 11, 2017. It was Feb. 3, 2009, and Assistant U.S. Attorney Eric Paxton Warner had a confession to make. “I have made a mess of the Borzynski case,” Warner told the court. The congressional deadline “required us to kind of, I guess, essentially work backwards from the way a normal condemnation would have been done,” Warner explained. Daniel Hu, the U.S. attorney overseeing the condemnation lawsuits, offered an apology. “We actually built the fence on land that we haven’t finished taking yet,” Hu told Hanen at a hearing. When pressed about problems or delays, U.S. attorneys continually blamed the deadline set by Congress for their mistakes. “The government had to rush,” Warner explained in defending himself from a sanctions motion. What’s more, Homeland Security had relied on a mistaken land survey to seize the tract. The new property line had been drawn to cut through the middle of an irrigation pump house owned by Brownsville. “Why did you only take half? You didn’t want the whole pump house?” Hanen joked. “We didn’t even want half actually,” Hu said. The circumstance is not unusual. Pamela Rivas is one of more than 40 property owners who have waited almost a decade for their cases to resolve. Many involve complex ownership claims. The government had to untangle who owned a small tract of land in Rivas’ case. That dispute, however, was settled years ago. The United States now owns about an acre of her land near a border crossing. But it has yet to agree with Rivas on a final payment..
Pedraza spent most of his life working as a farmer and foreman for rancher Rex McGarr, whom Pedraza affectionately still calls “my boss man.” When McGarr died, he willed 114 acres of Hidalgo County farmland to Pedraza and his wife, Olivia. But McGarr’s death led to decades of legal wrangling between other beneficiaries and attorneys for the estate. In 2008, the year Pedraza was first approached by an Army Corps land agent, he still wasn’t clear on what was legally his. But the federal government seemed to have figured that out for him. 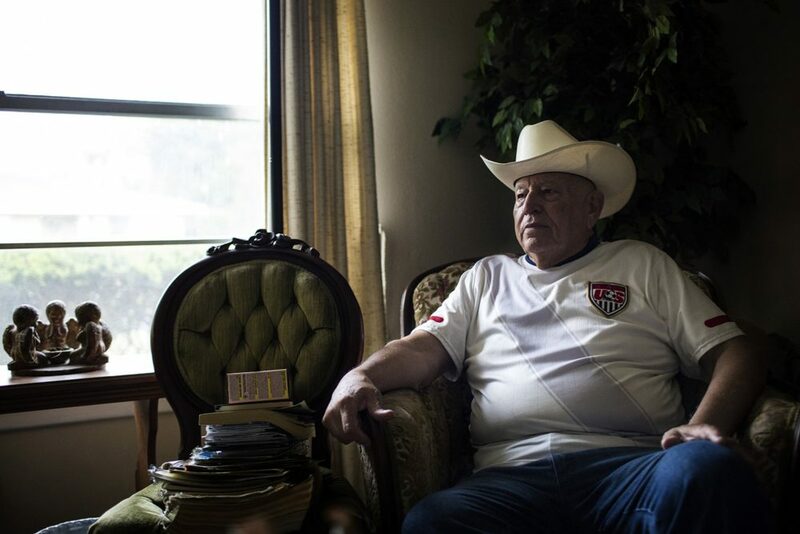 The real owner of the land was Pedraza’s next-door neighbor: Alberto Garza, the 91-year-old sugar cane farmer. Homeland Security had already paid Garza $45,000 for a total of 3.4 acres from Garza’s sugar cane farm, which stretches on both sides of a highway that parallels the Rio Grande near the hamlet of San Benito. 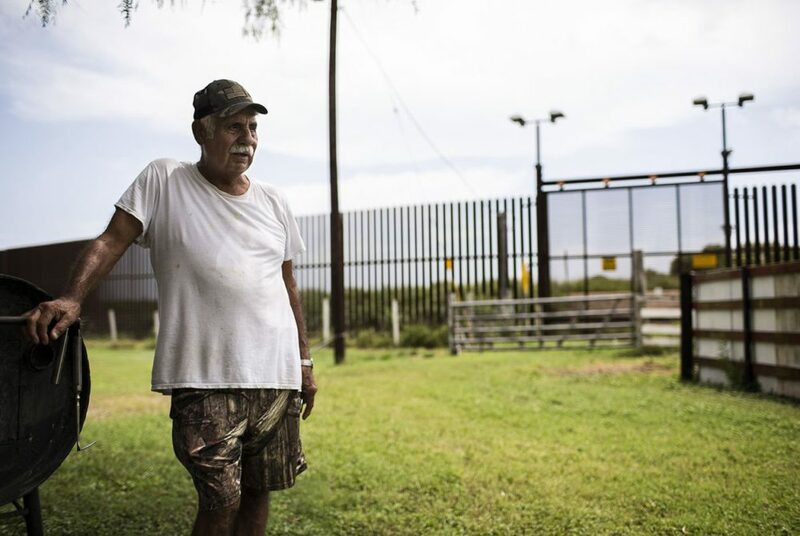 Border Patrol officials promised to build a gate in the border fence to give Garza continued access to the land that he had farmed for five decades. But when Homeland Security’s contractors showed up, they ignored the promise, according to his daughter, Norma Longoria. 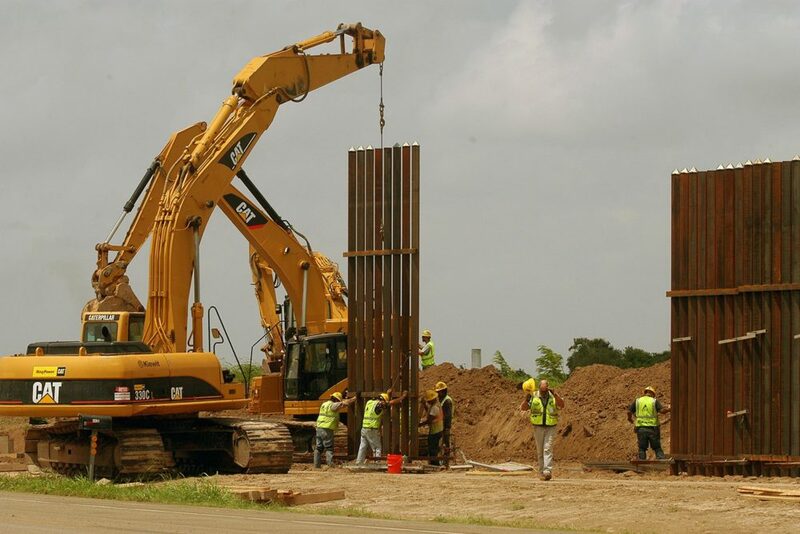 A construction crew works to erect a portion of the border fence along Oklahoma Avenue south of Brownsville on June 9, 2009. The spokesman said that many of the condemnation lawsuits in the Valley were filed to clean up problems with property tiles. In a so-called “friendly” take, the seller makes no objection, but the government files a condemnation suit to make sure that legal ownership is clear and no debts are attached to the property when the federal government takes possession. Vidaurri is a descendant of one of the pioneers who founded the town. Vidaurri’s family once owned thousands of acres around this spot off a lonely stretch of highway between Laredo and Zapata. Now, they farm some 1,300 acres of watermelon, cucumbers and grazing hay. A power company rents the land to extract natural gas. An irrigation pump draws water from the Rio Grande. These days, another feeling haunts him: worry. Since the presidential campaign began, Vidaurri has paid close attention to Trump’s promises about building a wall between the U.S. and Mexico. It would be 40 feet high and be made of concrete. It would stretch from the Gulf of Mexico to the Pacific Ocean. If Trump were to build that wall, it would run straight through Vidaurri’s ranch, which lies north of the Rio Grande Valley. When constructing the border fence, Homeland Security skipped much of the area around Laredo, deciding it was not a high enough priority. With Trump still promising the wall, Vidaurri figures it’s only a matter of time until Homeland Security arrives with bulldozers and pile drivers. When the time comes, he knows there will be no stopping the government. And he doesn’t think any amount of compensation will make him whole. “We can’t say our land is worth so much. Our land was bought with our blood, sweat and tears,” Vidaurri said. Vidaurri’s concerns are especially personal. From Dolores’ ruins, Vidaurri can walk a few hundred yards to a small, fenced graveyard on a bank overlooking the Rio Grande. Simple white crosses mark some graves. Others are surrounded by elaborate wrought iron fence. Many of the markers date from the early 1800s. In one corner, two flags fly: that of the United States and that of the U.S. Marine Corps. 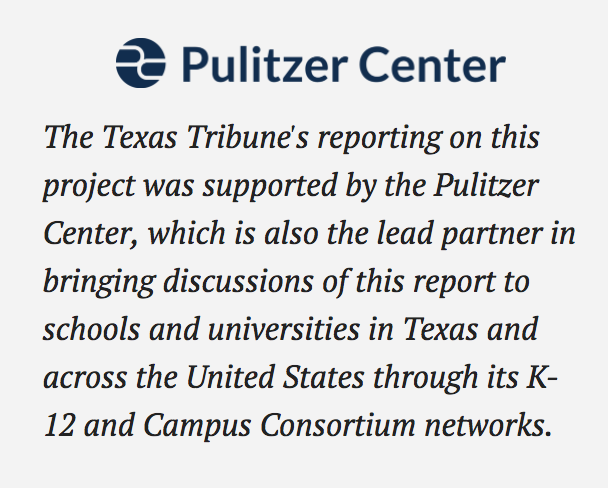 The Texas Tribune and ProPublica, which produces investigative journalism in the public interest, partnered on this project to expose the federal government’s unsettling use of eminent domain to seize land for a fence along the U.S -Mexico border.